Jane Stanbury goes messing about on the river – in this case Bangkok’s Chao Phraya. Bangkok is on the move, in all senses. It is one of the most popular global city destinations, with visitor numbers regularly beating London and New York. It has traditionally been a destination for the global backpacker or adventurous western travellers, but in recent years Russian, Chinese and domestic visitors have been major contributors to the statistics. This, along with developing industry, has resulted in economic growth and all that accompanies it. The east of the Chao Phraya river boasts a skyline any modern city would envy, with architects competing for superlatives. The awe-inspiring MahaNakhon – the Jenga Building, named after the wooden block game – is Bangkok’s tallest structure and has quickly become a city icon. Yet if you look closely, the original magical characteristics and culture that built Bangkok’s reputation can still be found, particularly on the banks of the Chao Phraya. The river remains the artery. During the day, ferries connect the numerous piers that join the city together while traditional Thai longboats convey tourists between the main sights. Hotel shuttle boats nip between the Shangri-La, Hilton and Peninsula, the grand dames of accommodation. As twilight descends, the evening cruises with their popular disco beats journey back and forth, narrowly missing the hulking, shadowy barges towed by noisy tugs. Somehow the inevitable collisions are avoided. 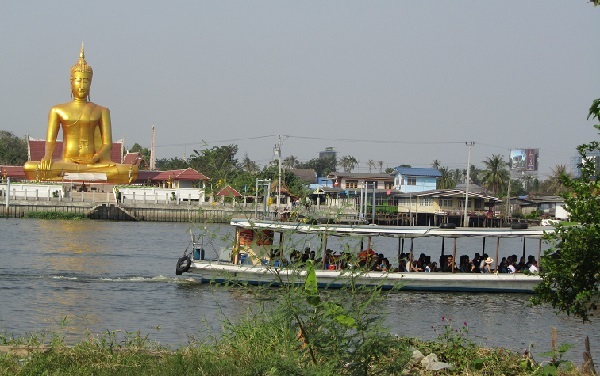 A new company, X2 River Cruises, has added an original twist to the river’s fleet with the introduction of a 30ft Venetian-inspired taxi boat offering sunset champagne cruises, shuttle services, canal tours and private excursions, one of which is to the charming island of Koh Kret. During an effortless 50min cruise, passengers can shelter from the mid-day sun in the air-conditioned cabin or choose to slide back the roof and take in the myriad of sights along the banks. There are golden Buddhas, stilted houses raised precariously above the water, swathes of tropical vegetation broken only by temple roofs, and entries to the khlongs, home to vibrant floating markets. Koh Kret was settled by the Mon people 300 years ago, and not a lot has changed since. As peaceful as when it was first created, there are no cars, taxis or, thankfully, tuk tuks; the harmony is broken only by the odd moped, or temple chants. Wat Porami Yikawat is the dominating temple, housing a marble Buddha, pagoda and museum. It is famed for its leaning stupa that seems to reach out to the facing riverbank. The X2 team invited us to seek out luck by striking a wooden chime in accordance with the time and date of our birth, and helped us to learn our fate from Buddhist fortune sticks by shaking a box of numbered bamboo slivers until one curiously leaps from the container. A selection of pre-printed fortunes, associated with the stick number, details what is to come. In this instance, it was an afternoon’s amble around the comparatively peaceful pathways of the island hamlets. The network of trails is seemingly just a snaking market, with miles of walkways boarded by an incredible array of stalls selling almost everything imaginable at ridiculously low prices. Brilliantly coloured silk shirts, skirts and shawls sway in the breeze. 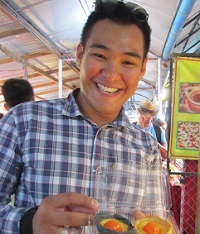 Frogs, snakes, terrapins, and eels are sold to bring luck to those that liberate them back to the river. A delicious variety of food, all freshly prepared by local vendors, includes fish balls, leaf wrapped snacks, fermented, pickled and deep fried flowers and satay-sticks of all varieties. An array of Thai desserts, starring coconut as the main ingredient, finishes up lunch on the move. The team also introduce us to “Aunty” at an open-air pottery hidden down a sleepy alley on the river banks. 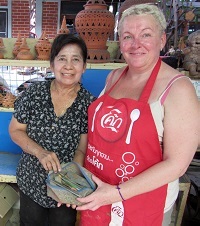 She is the fourth generation of her family to make “Kwan Arman”, the Mon-style pottery for which the island is famed, and is now training her children to become the fifth. Using clay harvested from paddy fields, a foot-powered wheel and the simplest of instruments, she creates intricately carved pots to be used for incense, candles or purely decoration. We are invited to try our hand, and she encouragingly laughs with pleasure at my clumsy attempts. On the homeward journey, the crew make sure we have the best photo opportunities as the sun lowers. Banks (yes really), the guide from X2, points out varying points of interest. The new medical training facility, industry and construction, along with the Grand Palace, home to the kings of Siam for more than four centuries. The Temple of Dawn, Wat Arun sits on the west side of Chao Phraya. Strikingly different from other temples, it consists predominantly of intricately-carved spires with mosaic and glass adornments. The principal Prang is 70m high and for the energetic offers an impressive view after the steep climb. Currently under renovation, it normally provides a tranquil respite from the east side of the river. Ironically it is most stunning viewed at sunset. 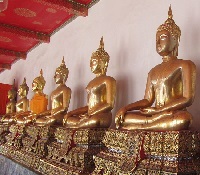 One of the most inspiring temples east of the river is Wat Pho, the Temple of the Reclining Buddha. The magnificent 46m long, 15m high Mona-Lisa smiling Buddha is quite simply breathtaking. A constant chime of metal on metal is the soundtrack to the Buddha’s resting place as visitors are encouraged to throw coins into each of 108 bronze bowls that line the back side of the statue. The complex is a maze of beautiful stupa, temples, and golden Buddha. It is hypnotising and melts away the horrors of the modern world. Despite its race towards urbanity, the enduring memory of Bangkok is still the omnipresent temples, shrines, and Buddha. There is always one around the next corner, down the next street or just around the curve of the river. X2 River Cruises is part of the Bespoke Hospitality Management Asia group which features hotels, villas, yachts, private jets and residences across Thailand. For a place to stay, the Amara Bangkok is convenient and stylish. The rooftop pool has one of the most enviable vistas in the city and is a great haven in the heat of the day.